I’ve been shooting videos for the weave along that begins on September 2nd. 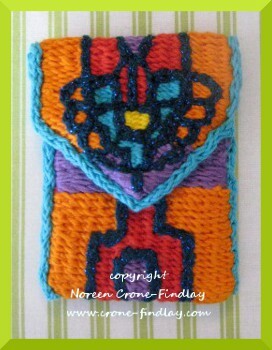 As I was shooting, I was weaving along on a couple of pouches. 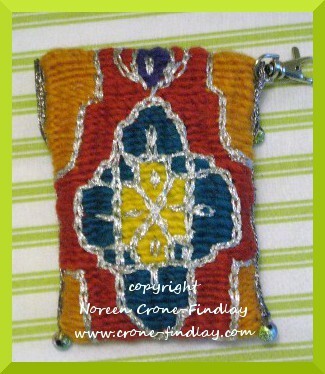 I wove it with Lion Brand Bonbon yarn- cotton for the body of the pouch and metallic for the embellishment. The size 8 beads along the sides are from Mirrix and the bone beads at the lower edge were in my stash. 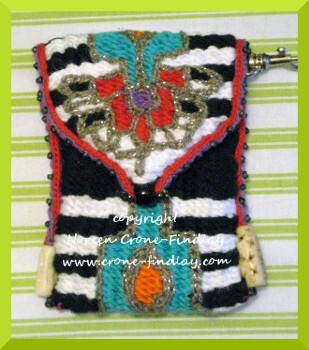 The medallion on the back of the pouch is one that I snitched from a box of stuff that my daughter in law was going to give away. I guess it’s because I adore these colors and use them all the time! Why? Well, because both my daughter and my daughter in law declared that they loved it and would love to have SantaMamma leave it in their Christmas stocking. I didn’t want to make two pouches that were exactly alike, so I had to have a big old think about it. And, I came up with the perfect answer!!!!! TADAH!!!! I wove it up in the same colorway, but used wool yarn instead of cotton. 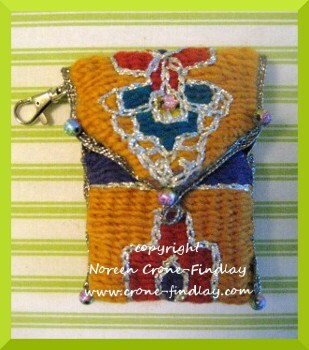 Kreinik supplied me with the gorgeous embroidery thread and edging cord for this pouch. I love the combination of the soft loftiness of the wool with the sparkle of the metallic embroidery floss. By the way, the embroidery thread is soft and lovely to work with. Some metallics can be barky and sharky. This is soft and nooshy. HURRAH! SantaMamma is so relieved! My girls will have their lovely pouches in their Christmas stockings, and they are ‘sister pouches’…. similar, but each unique! 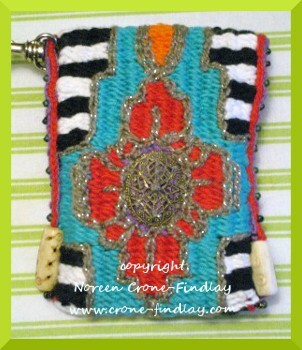 Noreen – Where is the video? I clicked on everything and it did not come up. Thank you, Maurine 😀 I hope that you will enjoy the weave along!